"The Urban District Council in 1903-4 opened up the Pictor Promenade and other river walks ... ". By the time this photograph was taken, probably in the second decade of the twentieth century, the Council had erected railings on this stretch of the riverbank which aren't shown on earlier images, presumably because the river is very close to the edge of the path at this point. In May 1903 the Council discussed lighting "the district from Dale Road to Matlock Green by Pic Tor" during the summer months. They mentioned the numbers using this route, and commented that there were many "nasty" corners and curves on it. 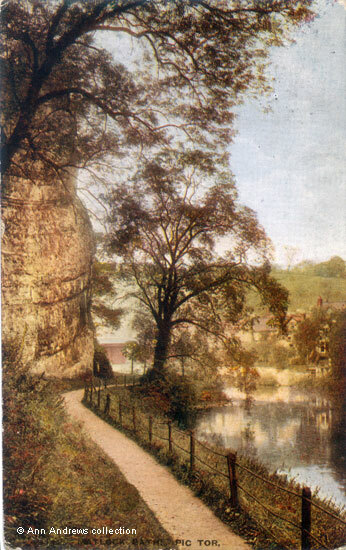 It was announced in September 1920 that Matlock Urban District Council "has acquired the Pic Tor Rocks and promenade, which leads from the park by the river Derwent to the Dale-road suspension bridge. The owner, Mr. F. C. Arkwright, Vice-Lord-Lieutenant of the County, has agreed to accept the small sum of £350 for the lot. On the highest point it is intended to erect the Matlock war memorial". The land the walkway was on had previously been rented to the Council for ten guineas per annum. This card was posted in Matlock on 27 Oct 1920 and sent to Miss Maggie Macdonald of Littleborough near Manchester. The sender was clearly enjoying him/her self. The message reads: "champion over here The afternoons are lovely just like summer and am spending my time outside". "Matlock Baths. Pic Tor". "Celesque" Series postcard, published by the Photochrom Co. Ltd, London and Tunbridge Wells. No. 49112. "Kelly's Directory of Derbyshire", 1912. "Derby Daily Telegraph", 14 September 1920.